Nestled in the winding alleyways of Füssen’s Old Town, the Maurus House stands as a charming and proud reflection of the city’s history. While maintaining its original, baroque architecture, which reflects the wealth of its owners during the Biedermeier period in which it was built, the house has been recently renovated and offers modern amenities in an impressive juxtaposition of old and new. Construction of the original Maurus House began in 1475 with the building of the foundation. It was originally a two-story house, with the floors above being completed around the year 1500. 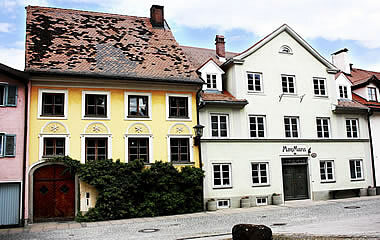 After a fire destroyed much of the Old Town of Füssen in 1842, the house, being nearly completely decimated, was rebuilt; this time with four stories and in the baroque style it is found in today. The Maurus House was named for its original owner, Magnus Maurus, a well-known and successful merchant and supplier to the royal family, who made his fortune in the salt and fruit trades.